Rebellion Games announced that “Sniper Elite V2 Remastered” is up for pre-order on Steam. You can also pre-order on the Sniper Elite website. The game will release on May 14. Originally priced at USD $38.49, the pre-order comes with a 10 percent discount, at $34.99. Those who own the original “Sniper Elite V2″ from 2012 can buy the game as an “upgrade,” for just $9.99. 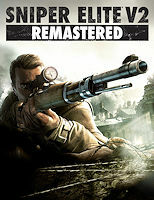 Sniper Elite V2 Remastered is built on Rebellion’s latest Asura engine, supports the latest hardware and technologies, and in the words of the developer, features updated environments, characters, weapons and vehicles, modernized rendering and post-processing effects, enhanced texturing and level geometry, a revamped lighting system, and dozens upon dozens of improvements and refinements. Rebellion has also carried the gameplay mechanics of “Sniper Elite 4″ over, so the rifles and projectiles behave more physically-accurate. Watch the Sniper Elite V2 Remastered – Graphics Comparison Trailer HERE.